Lithographic printing onto top quality 400gsm matt art board. Litho printing onto 300gsm silk art board. Cards can be folded on the long or short edge. Supplied creased but unfolded. Cards can be punched to make swing tags and hang tags. Bespoke sizes available. Metallic gold and silver printing is an option for business cards. 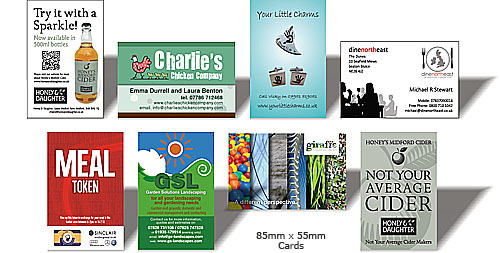 Print4biz - Business card printing prices. Bespoke Business Cards and Calling Cards. Free proofs. Free mainland delivery. Free document check. A7 cards, folded cards, credit card size business cards. A7 cards, Business card printing, business card printers, business cards, folding business cards, Calling cards, loyalty cards, club cards, membership cards, swing tags, hang tags.